In this conversation Judy Rhee talks about the craft of production design and art direction, taking a look at her work on commercials, TV productions and feature films. After discussing the similarities and differences in scope and pace for the various productions, she talks about her work on “My Blueberry Nights”, a romantic drama that takes Norah Jones on a journey across America. I’ll just go til I run out of places to go, and her path takes her from New York to Tennessee to Nevada and back. Explosively colorful, and yet never flashy, the film is a veritable cinematic feast, and Judy talks about how this production was unlike any other she has worked on so far. Kirill: You’ve been doing a lot of things in movies, TV and commercials. How did it all start? Judy: I went to film school and became interested in production design through watching films and taking a cinema studies class in the history of art direction. At the time they didn’t have any production design/art direction classes at NYU in the film department. They only had a Theater/Stage Design in the theater department, but as a film student you weren’t allowed to take classes in theater design unless you were a theater design major, so I ended-up taking related classes at Pratt Institute and SVA [School of Visual Arts]. While watching and critiquing films in classes, I found it puzzling how a lot of the films we’re just focusing on the camera work (i.e. renting helicopters and Steadicams), but no one was paying any attention to the environment they were shooting in – a lot of actors against white walls. I became interested in exploring how you can help tell the story visually by just making a few changes to the set(s) or locations. I offered my services to other students and started working on their student films to make their stories more interesting and compelling by modifying, adding or embellishing their film environments and sets. I was bar-tending and waitressing while attending NYU and 1-day one of my regular customers, who worked at the Metropolitan Opera doing make-up, came in and said he was working on a horror film called “Frankenhooker”, and he said they we’re replacing the art department that day and I should go down there if I was interested in working in the Art Department. I went there and was hired as an art intern, doing everything from driving the van doing pickups/drop-offs, making and painting props, helping with shopping and set-dressing. It was a non-union film, so everyone did a little bit of everything. It was a lot of work and a lot of fun – a great learning experience! After that film wrapped I was hired full-time in the art department for his second film, “Basket Case 2” dir. Frank Henenlotter. He did a lot of B-rated horror films. I wouldn’t mind working on a another horror film. From that point on it was just word of mouth, and I just continued to work steadily. 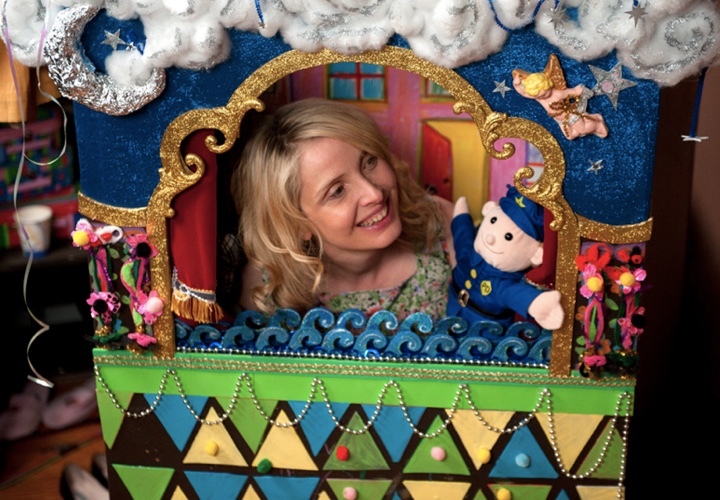 Opening scene of “2 Days in New York”, Julie Delpy in her child’s puppet theater, courtesy of Judy Rhee. Cut to 20+ years later, I’m still working on films and commercials. Sometimes I travel or re-locate for work. I went to Jordan to work on a film, “Stoning of Soraya M.” for 4 months, which was really an interesting experience for me. I worked in Atlanta on Tyler Perry‘s TV series “Meet the Browns” for 2 seasons. For that TV show I was able to utilize my background in commercials and movies because the pace of it was like doing a small film on a commercial schedule. Sometimes we would get a script on Tuesday, design a set on Wednesday, start building on Thursday, paint on Friday, set-dress it on Saturday and then shoot it on Monday. Even for TV, it’s a very fast turnaround. My experience and knowledge in working on commercials where everything happens very quickly allowed me to deliver what was expected in an abbreviated timeline. You still have to design these sets with narrative in mind of what the story is, who are these characters, what are we trying to convey visually – even if it’s a sitcom. My job is to support the director to help tell the story. I currently have a film out now in theaters, “2 days in New York”, written, directed and starring July Delpy and Chris Rock. It’s a sequel to “2 Days In Paris”. I just finished another comedy in NY called “My Man Is a Loser”. It was a very quick 24-day shoot. Written and directed by Mike Young, starring Michael Rappaport, Sean Young, John Stamos and Bryan Callen. It’s a first feature film for Mike Young, and he was one of the writers on “Entourage”. It went really well, I think it will be a funny movie. The current scheduled release is spring 2013. 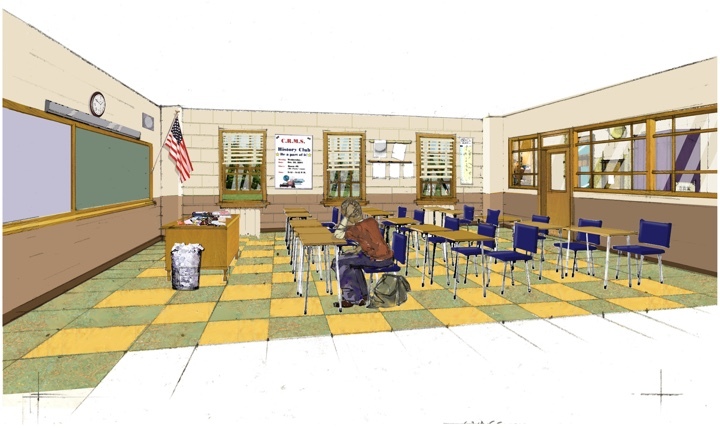 Classroom set rendering for season 3 of “Meet the Browns”, courtesy of Judy Rhee. Classroom final set for season 3 of “Meet the Browns”, courtesy of Judy Rhee. Kirill: Do you like moving between different types and scales of productions? Judy: Every project is different and there are always new challenges, regardless of the size and scale. The process is different from commercials to TV studio shows to films. I can’t say that I prefer one over the other. I like them all because it engages different parts of my brain and there’s always something new, whether it’s time constraints, financial challenges or different and specific expectations. The end products are different. If I can generalize; on a commercial the details of props and set-dressing can sometimes be more important and very specific to the product you’re selling, who the director is and what the expectations are from the Ad Agency and Clients. For Film and TV, the details are sometimes less important – it’s more about the broad strokes of story and characters, obviously depending on the director. That’s not to say there isn’t a narrative you’re trying to create in 30-second spot, you just have to convey it in less time, hence the importance of the specific prop(s) and/or set-dressing. Sometimes on movies I start on the broad themes before narrowing it down to the details or sometimes I start with the details and go wider, it all depends on my initial response to the script, the research I find and my meetings with the director. Every designer works differently. For me, I design from the inside out which means the more information I have about the characters and people I’m designing for the more authentic it will feel. It helps me to create and follow a story-logic in the design of the film. It’s important for me to know, or at least have a sense of who these people are, where they come from, where they are now and where they want to be. The more information I have from the story, writer and director the more I have to work with. The back story always helps to support the visual narrative whether you’re selling dishwashing soap in a kitchen (who’s in the kitchen, what kind of kitchen is it, etc…), or a much more involved environment with layers of character building in a movie. To me the design only rings true if you locate the characters in the spaces you’ve designed. It’s about the text and the subtext. You want your viewers and audience to see and feel more than just a room with a sofa, a lamp and a piece of artwork. 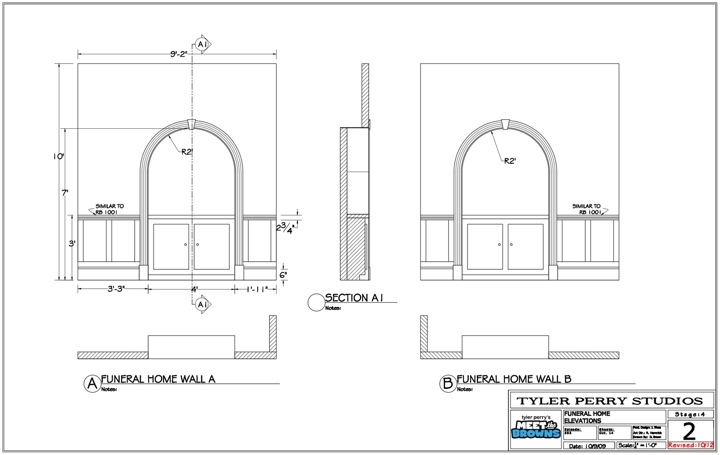 Funeral parlor set – elevation for season 3 of “Meet the Browns”, courtesy of Judy Rhee. 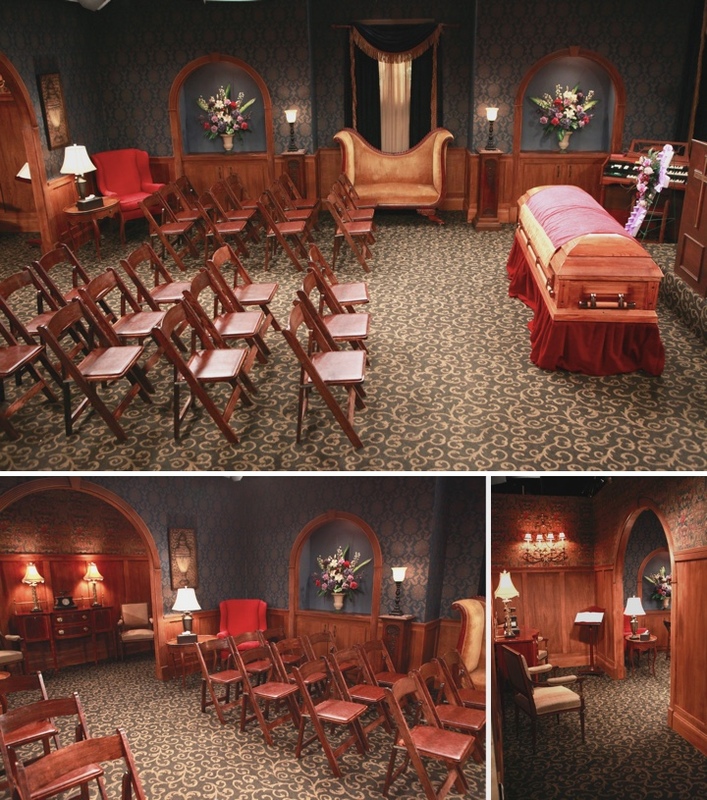 Funeral parlor set for season 3 of “Meet the Browns”, courtesy of Judy Rhee. Kirill: Even though on a commercial you don’t have to build a complete set around the action? Judy: It’s abbreviated and more generalized. If you’re selling a shower gel, it helps to know the target demographic of who you’re trying to appeal to because you’re not just selling a shower gel, you’re selling a lifestyle. We are selling dreams of how people want to identify themselves. Some of these subjects and angles may be discussed at meetings that I may or may not attend with the ad agency and clients during prep, but my focus and direction usually comes from the director of the commercial. Consumers and viewers pick-up subliminally or consciously what the messages are in a 30-second spot. You read the visual language and absorb the message in a faster form. It registers psychologically. So designing for a commercial takes all of this into consideration. Sometimes on a movie you have the luxury of time to pan across the entire room to reveal the whole space so the audience has the time to take-in the space. If not, and it’s a quick, one-angle shot in a film, you still want to get the pertinent information within that angle. Commercial sets from More.com directed by John Waters, courtesy of Judy Rhee. Kirill: With high-definition projection equipment in movie theaters, and the combination of BluRay format with high-definition TV sets at homes, how does this affect your craft? Judy: With high-definition you see everything, you don’t have the latitude as you do with film. Even darker-lit HD shots show more details than with the same lighting in film. I think a lot of crafts (i.e. Hair, Make-Up, Costume) – and not just art department – have an equally challenging job of adjusting to make it more perfect because you see everything. For example, when the scenic artist paints a texture or when the set decorator selects a fabric, wallpaper or the wood-grain of furniture – all that is seen with crisp clearness. It is a challenge, it takes more consideration and thought and can be a-bit more time-consuming to orchestrate all the right textures and age together; for example to coordinate the accuracy and consistency of age and texture of the props to wardrobe, etc. All these aspects have to be considered and coordinated in more detail. Kirill: How does the crew size vary on this gamut of productions, from commercials to TV shows to films? Judy: It depends on how much you’re building. Commercials have changed, much smaller budgets, less money to build sets. Ten years ago it wasn’t uncommon to build 2 or 3 sets for one spot on a large soundstage. Those are rare these days. It’s mostly one small set, if at all. Mostly all locations now. As for the crew, on commercials it’s much smaller than TV or films, but depending on where you’re shooting and the local union rules, you still have a set decorator/buyer, a prop master and assistant, a construction crew if you’re building on stage or modifying a location and a charge scenic with 1 or 2 assistants (depending on what your needs are) to paint scenery if you’re building or painting on location. It’s much smaller and faster on the commercials. Movies and TV require a bigger crew. The size of crew and how long they’re on the project is dictated by the budget of the film as well as the script requirements. For example, on a period-piece film/show it requires more people to achieve the historical accuracy thru construction and scenic work because you’re re-creating from scratch and/or modifying existing structures, as well as a bigger set-dressing crew. Even on a smaller budget present day film, you still have a construction, scenic and set-dressing crew, but it may only be a handful of people on for a few weeks instead of a larger crew throughout the whole movie. You have to be smart and selective about where you put your resources and prioritize what’s the most important visually based on the script. Kirill: What about computer-generated (CG) environments? Is this happening for commercials, or is it too expensive to use? Judy: Depending on the type of commercial, in general I think it’s less prevalent in commercials. You see it more in films as enhancements. It’s not always obvious or extreme like “Avatar” or “Titanic”. Even on films that you may not think has CGI, it still may have gone through post-production enhancement to adjust the colors, framing, etc. It’s much more integrated now in a way that isn’t obviously shown as CG. I think it’s more commonplace (budgets permitting) than even 4-5 years ago. Kirill: My impression a few years ago was that CG would become both sophisticated and cheap enough to gradually replace physical sets, and everything would be shot on green screens. That hasn’t really happened, at least judging the ever-growing budgets of tentpole sci-fi productions. Judy: It hasn’t completely replaced physical sets yet – thank god and hopefully, never will, but I think that this exploration is probably in the works. I wouldn’t dismiss it as a possibility for the near future. The best example is the “Lord Of The Rings” trilogy where they built sets and integrated CG environments. The merging of the two can work beautifully, but I don’t know that you’ll ever be able to completely eliminate building a three-dimensional set in real space. I don’t know if you can do that without it looking flat, but who knows, with the advancement of technology in this field, anything is possible? [Left] commercial for South West Airlines, [right] commercial for Levi’s. Also, the appeal may be wishful thinking that it’s cheaper, but it just means you’re now hiring people to build the set and paint it on a computer screen rather than people doing it in a carpentry shop or on a soundstage? Is that cheaper?? Unfortunately, what is does mean is the actual craft of lighting for film or building a set, painting and decorating it – these are real crafts that are valuable that may be lost. I don’t know whether these skills will be passed down in a way they used to be or should be? For example, the art form like stone carving is less in demand these days, so it’s not being passed down, and in the same way these skills will become highly specialized and harder to find, there will be fewer and fewer people who will know how to do these specific crafts. It will become a specialized niche market. Kirill: If the supply shrinks, the demand will shrink as well? Judy: Perhaps, but if you do know that particular skill and there is a need for it then it becomes a rarified and specialized skill and the scarcity of people with that knowledge will demand a certain price/cost for it. Supply and Demand. Kirill: But even with these tentpole productions on the scale of “Lord Of The Rings”, “Avatar” and the recent wave of superhero movies there’s still a large market for the “regular” sized productions. Judy: Yes, because I think people still respond to well-made, basic storytelling and a good script. Even if you have a lot of money for eye-candy effects, if your story/script isn’t solid and your actors don’t feel authentic, it doesn’t matter how much $$ you have. It either works on a basic level or it doesn’t. Sure, it’s great to have icing for the cake, but you still need the cake to hold the icing. Kirill: Let’s transition to your work on “My Blueberry Nights”. How did it start for you? Judy: I’m a huge fan of Wong Kar Wai [director], so you can imagine when I got the initial phone call for his project, I thought I had died and gone to heaven?! I remember seeing “Chunking Express” and “Fallen Angels” for the first time and feeling like he had captured something special in his filmmaking style that I hadn’t seen before. Then of course, when I saw “In The Mood For Love” his status as one of my favorite filmmakers had been sealed. I received a phone call from Carol Cuddy, a production manager here in NY. She first asked if I was available in the coming months and was kinda vague about the project. Then when she proceeded to tell me who the project was for I’m sure there was an audible pause on the phone as I tried to contain myself. She said he was coming to NY to shoot his first English speaking film starring Norah Jones, which at the time I thought was an interesting and surprising choice. Many production designers and art directors in NY were contacted. After I told her I was available and interested, she asked that I submit some concept boards based on the premise for the script. There was no script at the time, we were told that it’s about a woman’s journey across the country and the people she encounters along the way, she starts in New York, may go to Detroit, Memphis, Nevada and may end-up in California? That’s all we knew, and we had to come up with 3-design concepts. I guess everyone was given the same assignment. After doing days of research, the sources of inspiration that best captured the mood and feeling of what I wanted to convey we’re the photographs and images of William Eggleston, Mitch Epstein, Joel Sternfeld and Stephen Shore. I made it to the next round after submitting my concept drawings. During the third round I met with Wong Kar Wai in a production office in midtown. Also present was the D.P., Darius Khondji. We went through his script ideas, showed me a few preliminary location photos and asked me some questions. He also explained his approach and process and said that I would be working under his production designer, William Chang. What I didn’t realize at the time was the importance of William Chang’s role in the visual orchestration of Kar Wai’s films. He is not only the production designer, but also the costume designer, editor and oversees hair and make-up. Because they’ve done so many films together, they have a kind-of shorthand with each other. It really is a collaborative partnership. I passed the Kar Wai interview process and was hired. Of course I was over the moon and did cartwheels down the street for weeks! I couldn’t believe I was going to be working on a Wong Kar Wai film?! I was completely ecstatic! On the sets in Nevada and Tennessee, courtesy of Judy Rhee. I met William Change when he arrived in NY a few weeks after being hired when we officially started pre-production. We initially started our prep by location scouting in NY, Detroit, Memphis, Ely Nevada, Las Vegas and Santa Monica, CA. When we returned to NY (our home-base), we re-grouped on where the storyline would take place while continuing our prep in NY. I remember at the time it was busy in NY and I found it challenging to find a good crew for our budget range. I was simultaneously looking for crew in L.A., Memphis, Ely and Vegas as well. My official title on the film was art director. William Chang would tell me what his basic concepts were, and I would fill in the blanks, show him possibilities and options of what was available, affordable and could be done with our resources (i.e. manpower, time and money). At this point, William Chang and I worked closely together. William would occasionally discuss and consult with Kar Wai, but mostly there was an unspoken, symbiotic flow with the two of them. After Kar Wai and William decided on locations, William and I would figure out what we would do at each location and it was my job to execute and oversee all the departments: Construction, Scenic, Set-Dressing and Props. Because it was their 1st film in the U.S., it was an adjustment for Kar Wai, William Chang, 2-producers from HK and 1-producer from Paris to find themselves working with American union crews that dictates specific rules and regulations. Kirill: Was it important to shoot on these different locations across the country, moving the crew around? Judy: The people that went from city to city were just a few keys. It was the DP, the gaffer, myself, the location manager and the A.D. [assistant director]. That was it, everyone else was hired locally. We did bring the Set-Decorator, Leadman, 2-Set-Dressers and Charge Scenic from L.A. to Ely Nevada, Las Vegas and Memphis, thinking we would end-up in CA. All the other positions we found locally. My impression from both Kar Wai and William was that they preferred shooting in actual locations (always augmented) rather than building sets on a stage. They wanted to capture the unique characteristics, textures and feeling that each city and specific locations had to offer. Kar Wai sometimes had to be in the physical space once or twice before making his final decision on a location after seeing the photos and discussing it with William to see if it will work. We built very little. We modified and augmented almost all existing locations, but never built any sets from scratch for any part of the movie. This may have also been a financial decision. Kirill: So those were existing places that you took over? What happened to the actual businesses that were there? Judy: It was a challenge to find a location that had the right look and layout that we could shut-down for several weeks. The cafe in NY was called Palacinka, which unfortunately, no longer exists. It was in the lower part of SoHo. We closed it for several weeks to prep, (some construction and scenic work), set-dress and shoot and then restore it back to its original state. They were incredibly cooperative and very nice. It was a very small space, very difficult to work in. I’m sure that after seeing his films you understand that he likes a claustrophobic feeling. Even if it’s a large space, he shoots in a way that compresses the space and makes it all feel much smaller. But the actual cafe was challenging to work in with all the equipment (camera, dolly, lights, etc..) actors, crew, set-dressing. On the set in New York, courtesy of Judy Rhee. Kirill: That was my impression as well, that there was almost no space to move the camera around. Judy: A lot of the shots we’re done from the outside of the cafe shooting thru the windows. The biggest challenge for us (art dept.) was finding the right size pie case in a specific style. William wanted a particular style of pie case that was integral to the actor’s blocking that we could also use as a light source in the middle of the cafe. After the Decorator searched for days, she finally found one in the right style, right size and one that we could afford. The next challenge was how to get it in the space because it weighed a ton! We had to remove the front door and frame to accommodate it’s depth. It took 5-6 Set-Dressers to lift it up and over the bar before placing it on the floor to where it played. I remember that day vividly. Kirill: How does such a small space affect the way you augment it? Judy: One element we added to the space to allow more camera angles was a wall of mirrored panels above the booths. It’s a signature of Wong Kar Wai and William Chang to shoot frames thru mirrors. This is seen repeatedly in “In The Mood For Love”. Our scenic crew also aged and distressed the mirrors and hardware to match the overall patina we implemented in the space. Almost every piece of set-dressing or prop had a highly reflective surface, nothing matte or flat. All the paints we used we’re high-gloss or semi-gloss, never a matte finish. These we’re deliberate choices to call your attention to the varying degrees of kicks and blings that you’d see as the camera dollied by. We also hand-painted lettering on the front windows to add another layer of texture and color, as well as to have something obscuring the frame when they shot thru it. Adding and replacing light fixtures also had strategic placement for the camera. The overall effect was a completely different personality from the space we started with.. Much more layered, textured and colorful. “My Blueberry Nights” was the first film I worked on where the Director and the Production Designer specifically requested shiny, reflective surfaces. Usually Directors, D.P.s and Designers want surfaces to be matte, flat – not shiny. I think it’s a luxury to work with the same crew for many projects so that you’re all on the same page and have an unspoken creative understanding. Kirill: That was a very visceral visual experience as the camera goes through the glass, through the lamps, reflecting off of mirrors. Judy: Perhaps, it was to introduce and convey the characters’ inner life or the complexities that people have within themselves? Perhaps, it was to show what’s about to happen in the layering of the story or the backstory? Like William Chang’s aesthetic choices, the story and characters are also multi-layered. I think it’s how Kar Wai likes to tell the story, a-bit unclear, ambiguous? It’s part of his visual language of his films. Nothing is ever spelled out. What I learned from Wong Kar Wai and William Chang on “My Blueberry Nights” was the art of layering elements within a frame. Nothing was there by accident, everything was thought thru and coordinated: the camera angle, the lighting, the wallpaper, the costume, the prop, hair and make-up. I teach a class at NYU on art direction in film, and we cover a section on texture and color, one of the segments I show is from “In the Mood for Love” because it demonstrates how to merge color and texture to help tell the visual story. William is a master at that. Even if you’re not consciously aware of what you’re looking at, you feel all those elements in the story: the sensuality and tension of the characters, their class and social status, the temperature of summer in Hong Kong. Kirill: Most of the scenes in New York cafe and Memphis bar happen during the night time, with a lot of neon inside lighting. How did this lack of natural lighting affect your work? Judy: Knowing that these scenes would be shot at night the specific locations we’re chosen with this in mind. Part of the look we we’re trying to create in these two segments was a timeless, romantic aspect specific to each city. This was also considered when choosing color palettes for each city. The colors we’re more about mood and feeling. A lot of the colors chosen for the scenes at night were very vibrant. William Chang assigned Cobalt Blue to Norah Jones‘ character as a color that travelled with her throughout her journey. Sometimes in her wardrobe or a prop that she would hold. Kar Wai and William had many discussions with the D.P. and Gaffer about the lighting. Because this was their first time working with Kar Wai and William, they followed Kar Wai and William’s lead on how the sets should be lit. They also painted-in additional layers of colors with lighting. So, we introduced the base layer of color with the interiors of the sets, set-dressing and props, the neon lights added another layer and the Gaffer used specific temperature bulbs and gels to place colors in the set as well. It’s all very subtle, but this was a production that allowed time for lighting. The colors that William chose may have appeared too bright during the day, but knowing that it would be dimly lit, he somehow knew exactly how it would all work together on film. Kirill: Was it difficult to get into the state where what you see with your eye does not match the intended final look? Judy: It took me a while to understand William’s choices. It wasn’t until I saw everything on set together with the specific lighting that I understood why he made those decisions. William knew exactly how each set would be lit and made his selections based on that information. You don’t always know how the set is going to be lit until the day of the shoot or a pre-light if you’re lucky, but having this information is key for Production Designers. Kirill: What about the daytime diner in Tennessee and the casino in Nevada? Judy: The Arcade Diner where Norah Jones’ character waitresses during the day had 2-walls that formed a right-angle of large windows to utilize the natural light during the day. This was to contrast the dark, no windows night-time shots of Ernestines bar, which was caddy-corner to the diner. It was also a choice not to have as much color or texture at this location that we would only see during the day. We shot the interior of Natalie Portman‘s gambling scene in Vegas and some of the exteriors in Ely, Nevada. The interior was a dark bar that we turned into a gambling room. On the set in Nevada, courtesy of Judy Rhee. Kirill: You didn’t have a lot of fast cuts or camera movements for these inside scenes. The camera either lingers on the specific character or pans slowly, catching different layers and reflections. Judy: We knew what the camera angles were before we made selections for each space. There we’re a few dolly shots in each location, but very little. A lot of static shots, the actors were the only things moving in the frame. That’s one of the many things I appreciate about Kar Wai as a director, he likes to hold on a scene, and it’s not a lot of frenetic editing. He wants you to see what’s happening in the scene. He wants you to see the space. In many ways the space is another character. Kirill: Did you keep notes between the takes to make sure that it looks consistent? Judy: We had floor plans of all the locations and William sometimes made notes on them for Set-Dressing, but the propmaster and script supervisor kept track of continuity on set during shooting. William was very specific on where he wanted everything, so the on-set dresser had to stay on his toes about where everything was and to make sure it was exactly where William wanted it. When we did reshoots for scenes in Ernestines bar in Memphis, we we’re able to recreate a part of it in New York almost a year later by using dailies, set photos, notes and diagrams, and of course our original location photos. Kirill: The movie came out in 2007, and stepping a bit away from it, have you taken some of these techniques with you to other productions? Judy: I try to use as much of the “layering” effect as I can no matter what I’m working on… Architecturally, scenically (painting) and set-dressing. It all helps to create depth and dimension. Even if you’re shooting with a long lens, a two-wall set or a tiny room, there are many opportunities to introduce layers. It’s always good to have many options of angles to shoot the set. Kirill: With reflections you have more chance of catching the crew or unfinished parts of the set on those surfaces. Judy: You can adjust the camera angle and/or the reflective surface to avoid showing what you don’t want to see. There was never a reflection of a truck or unfinished/undressed parts of the set. You work out these kinks before rolling camera by looking at the monitor. A lot of films are in a hurry to get the shot and move on, but Kar Wai often did 23 takes of the same scene until he felt he had it. He’s one of the few directors who still has that luxury. Kirill: Can you recommend a few of your favorite productions? Judy: Such a hard question, there are so many… Off the top-of-my-head, Stanley Kubrick‘s “2001: A Space Odyssey” is still one of the best films ever made in my opinion. The story, the acting, the camera work and lighting, the set design, special effects, the music… it all comes together so beautifully. Seeing that on a big screen today still holds up. I can’t really think of another film that covers every aspect of filmmaking to the same degree. Another film, that comes to mind is “Blade Runner”, which also still holds up today, with maybe the exception of the lack of cellphones in the future. It’s another example of great script, great production design, great camera work and lighting, great music, great editing – it’s all these elements that make it a really great film. And here I’d like to thank Judy Rhee for taking the time to answer my questions, for sharing her materials for the interview and for her wonderful work on “My Blueberry Nights”.